Health worker taking care of cholera patients (file photo). Government has set up an inter-ministerial committee to come up with a lasting solution to the cholera outbreak in Harare and other parts of the country. The committee is chaired by Local Government, Public Works and National Housing Minister July Moyo. Other members of the committee are ministers Obadiah Moyo (Health and Child Care), Mthuli Ncube (Finance and Economic Development), Joram Gumbo (Energy and Power Development), Prisca Mupfumira (Environment, Tourism and Hospitality Industry), Perrance Shiri (Lands, Agriculture, Land, Water, Climate and Rural Resettlement) and Monica Mutsvangwa (Information, Publicity and Broadcasting Services). Minister Mutsvangwa announced the committee during her first Cabinet briefing to the media at Munhumutapa Government Offices yesterday. The briefing is in line with the new policy introduced by President Mnangagwa that in the Second Republic the citizenry should be kept abreast of key Cabinet decisions to promote transparency and accountability. As such, after every weekly Cabinet meeting, Minister Mutsvangwa will brief the media on key decisions made. The briefings are attended by the implementing ministers and the Chief Secretary to the President and Cabinet. "Cabinet also established an inter-ministerial committee, which will spearhead short- and long-term measures to address cholera outbreaks in the country," said Minister Mutsvangwa. "This committee comprises ministers of the following ministries: Local Government, Public Works and National Housing and he will be chair, Health and Child Care; Finance and Economic Development; Energy and Power Development; Environment, Tourism and Hospitality Industry; Lands, Agriculture, Water, Climate and Rural Resettlement; and Information, Publicity and Broadcasting Services. "As part of the long-term preventive measures, Cabinet directed that all municipal authorities should procure and install the critical infrastructure surveillance systems detecting all the pipes, which are breaking down. It has also been seen that a central authority be established to coordinate the designing and construction of water and sewer infrastructure in our metropolitan provinces where several local authorities co-exist with central Government playing a pivotal role. "Finally, in order to facilitate close supervision and monitoring of progress in addressing the current cholera outbreak, Cabinet directed that the inter-ministerial committee, which I have just talked about, will be providing regular briefs to the Presidency on the programme." Minister Mutsvangwa said Government was determined to ensure that the outbreak of cholera was dealt with once and for all. "I want to assure you that this is the last time ever this mediaeval disease will stalk this beautiful country of Zimbabwe and the Sunshine City," she said. "Following receipt of a report of the current cholera outbreak epidemic and measures being implemented to stamp out this outbreak, Cabinet greatly appreciated the overwhelming response to Government calls for assistance by the private corporate sector. Social partners also did come in, individuals including Zimbabweans in the Diaspora." Minister Mutsvangwa said Government was adopting a two-pronged approach to address the cholera epidemic, namely: "The ongoing implementation of interventions to address the current cholera outbreak, two, the implementation of long-term measures centred on the provision of adequate clean water and upgrading of both water and sewer reticulation systems. "That resources be mobilised from external sources for re-designing and modernising the water and sewer reticulation systems as well as addressing the problem of illegal and unserviced human settlements in our urban areas. That to ensure transparency and accountability in the utilisation of resources availed by stakeholders for this purpose of fighting the current cholera outbreak Cabinet directed that such resources be channelled through the Ministry of Finance and Economic Development based om proper accounting procedures." Yesterday's briefing was attended by Ministers July Moyo , Obadiah Moyo, Prisca Mupfumira, the Chief Secretary to the President and Cabinet Dr Misheck Sibanda and Presidential spokesman Mr George Charamba. 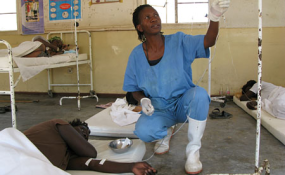 So far cholera has killed 30 people and left 5 000 others seeking treatment.